Since 1998 you can visit my website "The Flight of the Condor". The revision of it in the year 2010 was overdue - the last great revision took place in the year 2000, when I changed the appearance and outlook of my website to the one you are used to. Many articles were outdated and no longer representing my views since my own practice improved and I learned a lot in the last decade. The revision had begun already in the year 2007, the major workload was not visible on the website because first I revised all articles in my german PDF, from which another PDF and a book resulted. The articles on the practice of contemporary shamanhood are one of the most important section of my website. I divided them into several subsections to offer you a better orientation then before. If you want to read the articles offline as book or PDF I have to put you off till I compiled the new translated articles in a readable form, as PDF and of course as a book. Currently only the german version of the articles on shamanhood are published as book and PDF. In the section named publications you can check whether the english versions are already online - but if you read this I am not finished with it yet. Here in this section you can read articles dealing with shamanhood in general. Currently only one article is listed in this section. It is is a general introduction into shamanism and shamahood - of course from my own point of view. As in all other sections and articles my opinion is not to be taken as an absolute truth or a complete account. By the way: The dancer you can see on the right side here, that is me during one of my condordances. 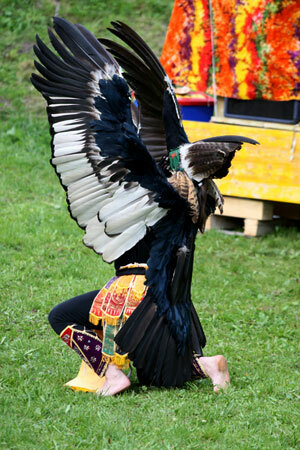 I have dedicated a whole section to the andean condor and my dances. If you are interested in them, check the navigation-bar or click the image itself.